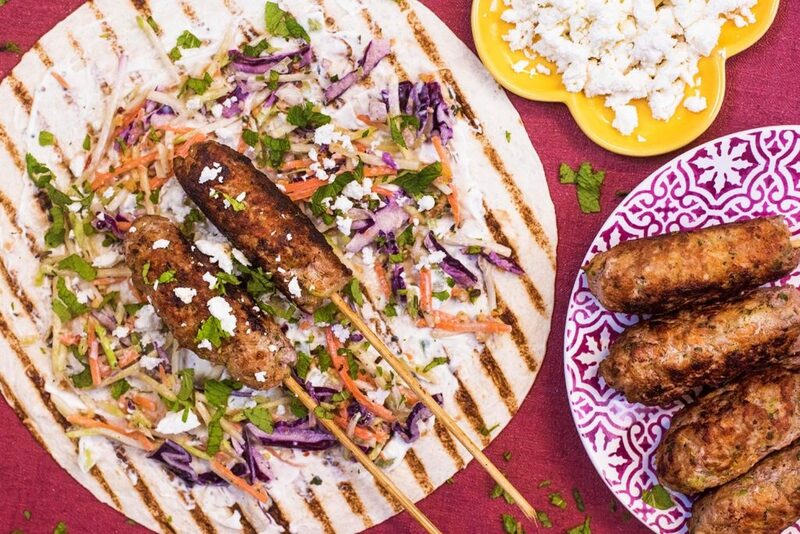 These herby Veggie Packed Lamb Koftas are easy to cook in a big batch for a crowd and we have found a way to sneak some extra vegetables in to a traditionally meaty dish. Juicy lamb with shredded carrot an courgette, all bound together with herbs and spices. 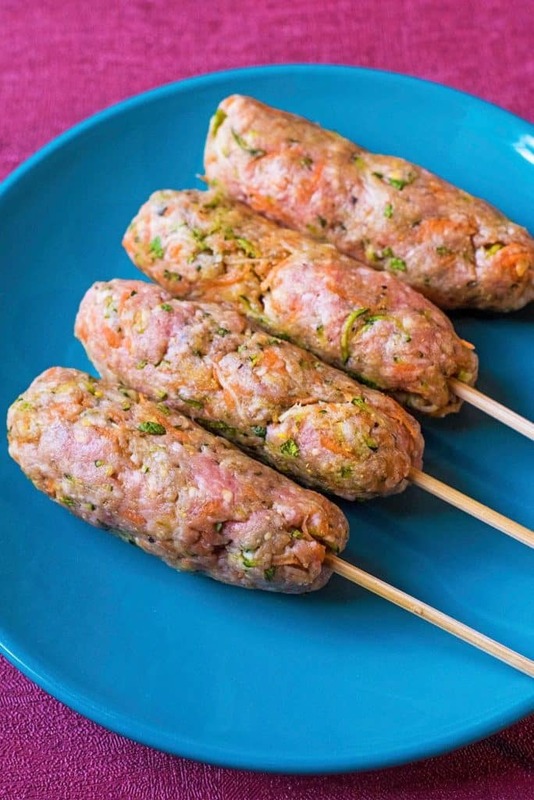 Lamb Koftas are a Turkish dish that consists of succulent lamb mince mixed with herbs and spices and then formed in to a sausage shape on a wooden skewer and then grilled over charcoal. You will find them on almost every Turkish restaurant menu, but this is our lighter version of it, that is packed with vegetables. Just a few ingredients, but lots of flavour. A great addition to a fancy BBQ, but equally perfect for a quick and easy weeknight meal that you can prepare in advance and then cook when you get in the door. These are great for when you have friends over for dinner. 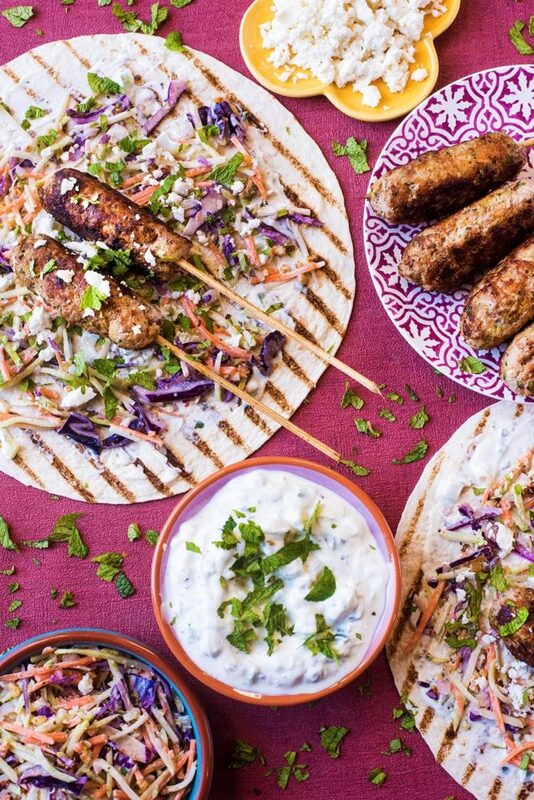 When it comes to dinner party recipes, anything that is a “build your own meal” is usually a winner for us, as you just cook the main part (the lamb koftas), make some sauces and salads and put everything on the table and let people build their one. 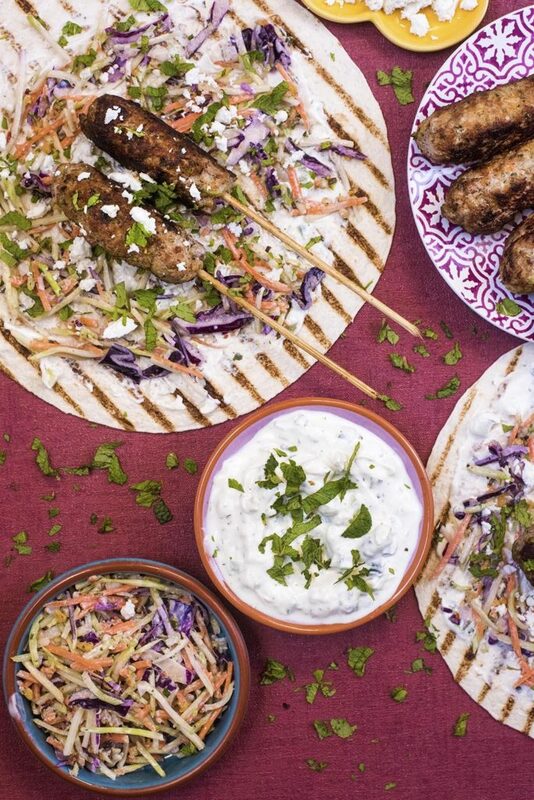 Dinner parties are a sociable thing and these lamb koftas are a sociable meal. Picking what to make for a dinner party can be hard, as it has to be something that everyone enjoys. However, I have never met a meat-eater that doesn’t like lamb. It’s juicy, succulent, full of flavour and really easy to cook with, which is why we are happy to be a Llambassador. 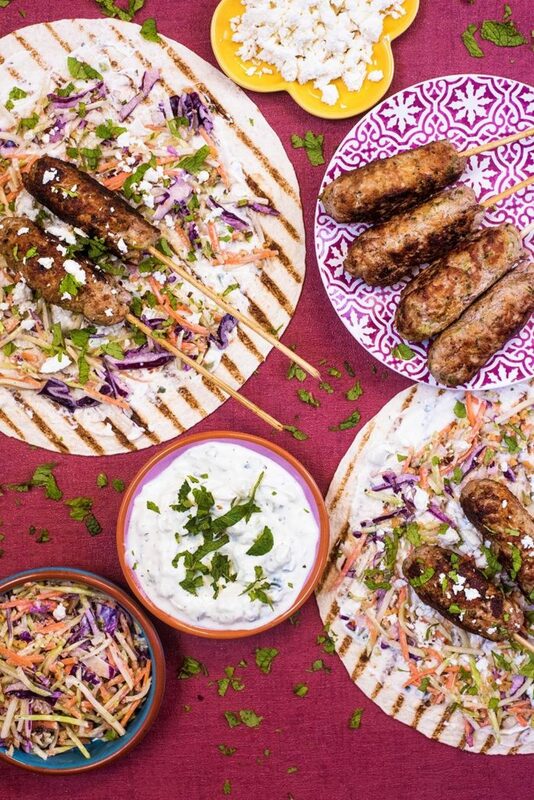 We were picked by Welsh Lamb to be a Lightening Llambassador and come up with a short, simple and quick lamb recipe and these koftas take less than 10 minutes to cook. It seems that when people think of lamb, they think of slow roasted, but it can be made in to a quick meal too. When it comes to lamb dishes, it has to be Welsh Lamb. Only the best of the best goes into creating PGI Welsh Lamb. They create premium, superior quality PGI Welsh Lamb using the best that Wales has to offer. Hundreds of years of farming traditions have been dedicated to PGI Welsh Lamb husbandry. Welsh farming techniques have been honed again and again. And it’s taken millions of years to craft the perfect landscape for rearing lamb and cattle. This unique environment, and heavy rainfall, creates the luscious Welsh grass and heathers that gives PGI Welsh Lamb its unique taste. So, you can really taste the quality in Welsh Lamb, which is why we always use it in our lamb dishes. This is very much a prepare the night/morning before and then cook it when you get home from work kind of dish. We have some extra time in the mornings now, as Avery is in nursery, but not much time in the evenings when she is back. We are trying to eat as a family each evening (especially as we have a nice new dining table), so it has to be something we can make in under 30 minutes. This comes in way under 30 minutes. In fact, it tastes better if you leave it in the fridge for a couple of hours before cooking, as the meat really gets all the herbs and spices in to it. What Vegetables Can I Add? One of the best things about this recipe is that it has vegetables hidden in them and you would never know. Shredded carrot and courgette bulk out this recipe, so you get all of the flavour of the lamb, but with some added vitamins from the vegetables too. You could also finely shred some mushrooms and mix them in to the koftas, as they have a really meaty texture anyway. 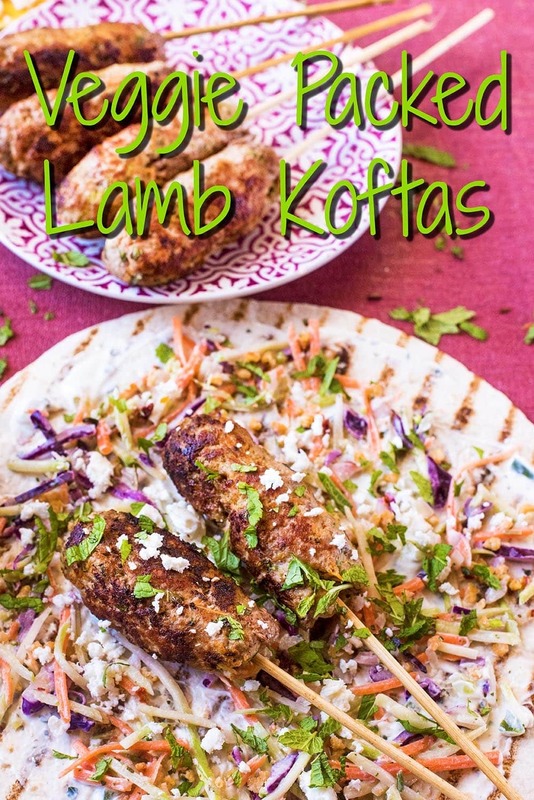 What To Serve Lamb Koftas With? 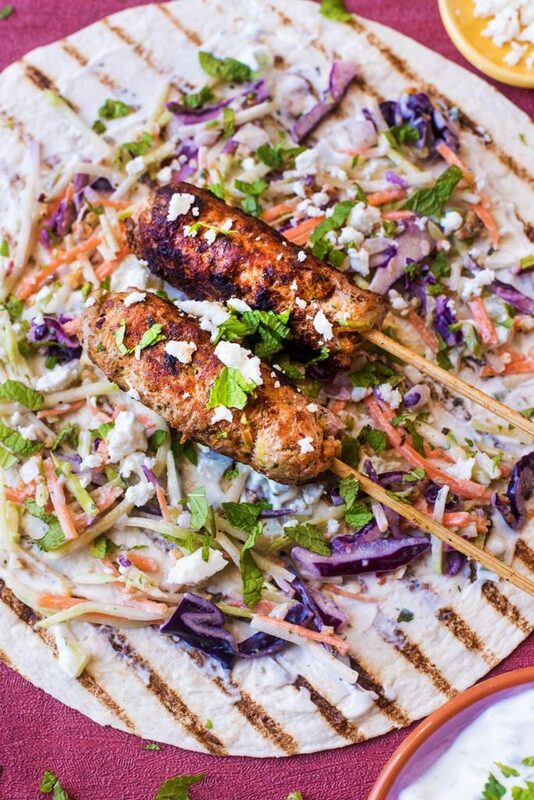 We served ours with some homemade flatbreads, tzatziki, homemade slaw and of course some feta. These would go equally well with a salad or even some homemade sweet potato fries. Whichever way you make them, make sure you use Welsh Lamb so you know you are getting the best quality. One: Put the lamb in to a food processor and blend until it becomes mince. Two: Put in the bowl with the rest of the ingredients and use your hands to mix everything together. Three: Divide in to 8 balls and then roll each in to a sausage shape. Carefully thread them on to pre-soaked wooden skewers. Put the koftas in the fridge for at least 30 minutes so they are chilled and hold together. Four: Heat a tbsp of oil in a large pan and add the koftas (cook in batches if needed) and cook for 7-8 minutes, turning frequently so all sides are cooked. We used carrot and courgette as the hidden vegetables, but you could shred some mushrooms to mix in, as they have a meaty texture. 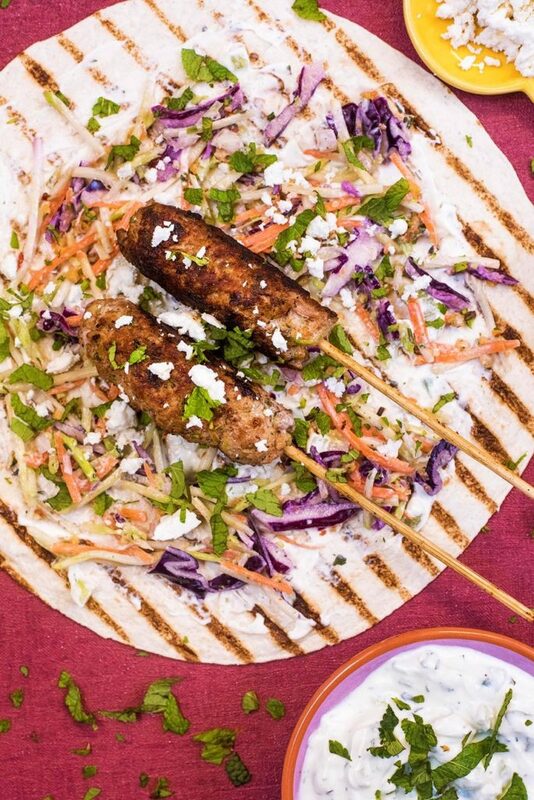 Serve these koftas with homemade flatbreads, tzatziki, hummus and slaw. Some creamy feta sprinkled on top of these really tops the dish off. Not a fan of lamb? You can make these with beef or pork instead. If you’ve tried this, or any other recipe on the blog, then let us know how you got on in the comments below, we love hearing from you! 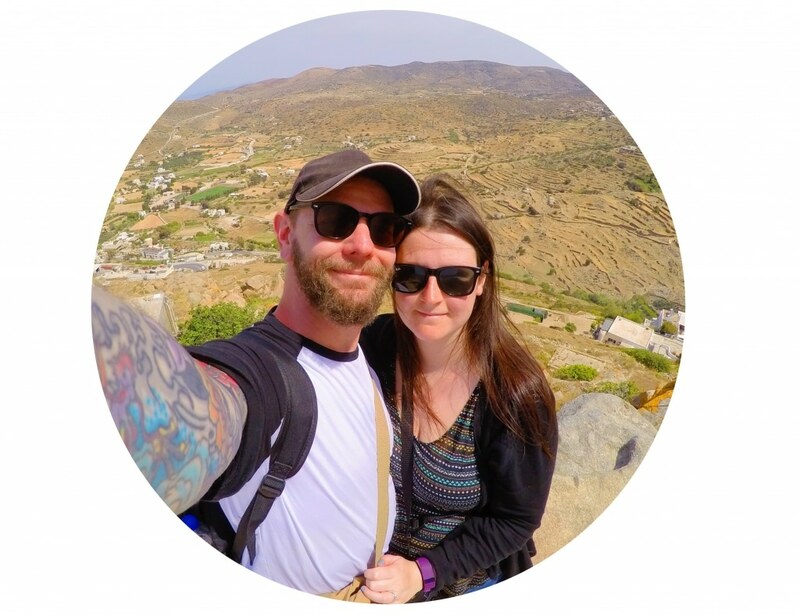 You can also FOLLOW US on FACEBOOK, TWITTER, INSTAGRAM and PINTERESTto see more delicious recipe ideas, behind the scenes shots and also what we are getting up to. 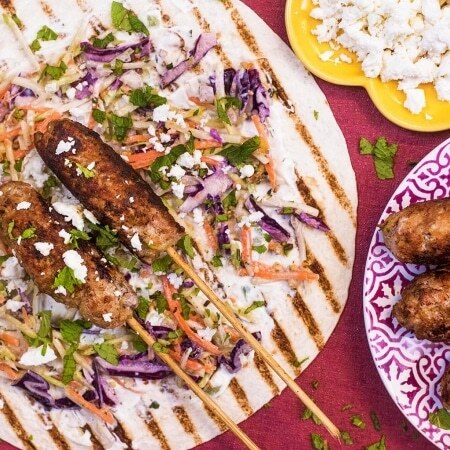 These herby Veggie Packed Lamb Koftas are easy to cook in a big batch for a crowd and we have also found a way to sneak some extra vegetables in to a traditionally meaty dish. Put the lamb in to a food processor and blend until minced. Put in a bowl with the rest of the ingredients and mix until everything is combined. Divide in to 8 balls and then roll each out in to sausage shapes and carefully thread them on to wooden skewers. Make sure the skewers have soaked for 30 minutes so they don't burn. Put the lamb koftas in the fridge for 30 minutes, so they are chilled and hold together. Heat 1 tbsp of olive oil in a large frying pan and add the lamb koftas (cook in batches if needed). Cook for 7-8 minutes, turning so all sides are cooked. 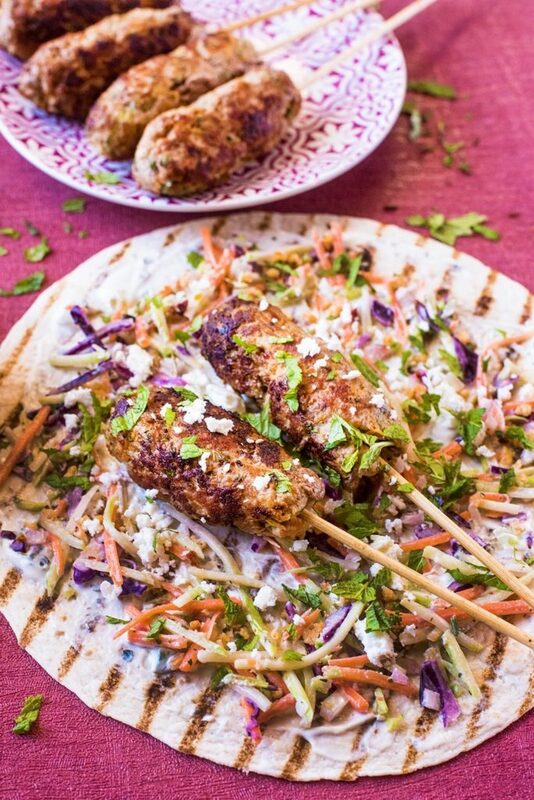 Serve with Flatbreads, slaw, tzatziki and feta. I always think of lamb as a so cook meal and I’m never adventurous with it at all. These look delicious and all in 10 minutes!